President Obama is travelling to Alaska to blame glacial melt and rising temperatures on global warming. This is his usual fraud, as Alaskan glaciers have been melting under every single president going back to George Washington. During George Washington’s presidency, Glacier Bay was retreating eight feet per day. His temperature claims will be equally fraudulent. 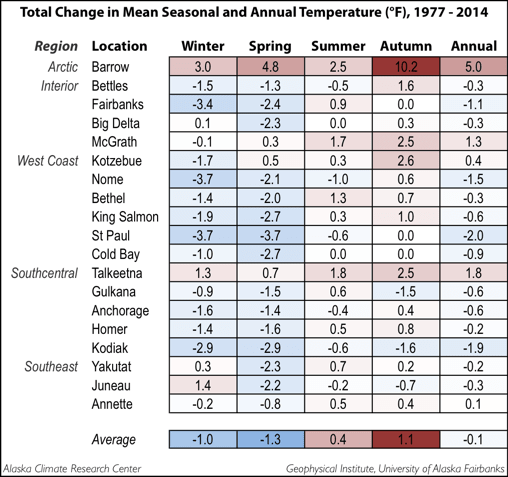 Alaska temperatures have declined 0.1 degrees since Jimmy Carter was President – during the ice age scare. Obama will also lie about forest fires, which are controlled by the PDO and position of the Jet Stream. In the first 10 years of statehood, Alaska averaged barely a quarter million acres of wildfires yearly. The last 10 years have averaged 1.2 million acres. “The state is changing and changing rapidly,” said Fran Ulmer, chairwoman of the U.S. Arctic Research Commission and Alaska’s former lieutenant governor. The cold years 1972, 1974 and 1977 (the ice age scare) all had much larger burns than the average of the last 10 years. As always, Snake Oil Obama is sliming America with fraud, lies and junk science. if the glaciers were advancing, would Obama stand on it and celebrate? can we Goldilocks the climate? how large should the dang glaciers be? Washington (CNN) For two months they were submerged under the ocean’s surface, much of that time far below a solid mass of ice. As they passed through the Bering Strait bordering Russia, they steered around undersea ice formations more than 30 feet deep. When they finally punched through the Arctic ice cap just shy of the North Pole, it took them five hours to break the ice off their submarine’s key hatches so they could reach the fresh air. What they found awaiting them was a cold, white world of silence, of complete isolation, with not so much as a bird in sight. You’d thunk that Obama would have paddled his little pink unicorn rowboat out there in that open melting Arctic to greet them. Science has been long kicked to the curb and run over by our owners who want desperately to tax THIN AIR. Nothing will stop them except angry mobs which is quite possible as it gets progressively colder. Curious . . did it come to you in this format?
. . . all of them prior to any AGW. I am not sure what exactly happened in the july of subsequent years? How did the harvests go? My own results show that it has been cooling significantly in Alaska, at a rate of -0.55K per decade since 1998 (Average of ten weather stations). temperatures seem to shot up in the past few years. Unless President Grover Cleveland did ‘it’ during both his separated terms, the big 0 would be the 43rd! Just pointing out a historical fact apparently ignored by most people. I want some global warming…. please. I DO NOT like the cold. !!! Alaskan glacial melt under all presidents before Ulysses S. Grant must be discarded until further notice. Alaskan glaciers prior to 1867 consisted of Russian ice made of Russian water*) which is tough and hardened. It doesn’t freeze at 0°C like American water. It carries on when other water stops moving. Mark Serreze should be criticized**) for not having yet adjusted the glacier retreat history maps prior to Alaska Purchase. We are certain that when the positions of each glacier terminus are recalculated and adjusted based on the different physical properties of Russian water, we will find that the glaciers of Alaska were not retreating but virtually advancing under every president from George Washington to Andrew Johnson***). **) Other agencies and research centers are continuously adjusting their historical data sets to support the President’s strategic initiative. Where is the contribution of the National Snow and Ice Data Center? Why is Dr. Serreze sitting on his hands? ***) The presidency of Andrew Johnson is straddling the data discontinuity. The Presidential term is drawing near and his next job could be as Ronald McDonald ; all the clowning around & nonsense has been well rehearsed ! The scumbags at the LA Times are running an article about an Aleutian Island that is being swallowed up by sea level rise in Alaska. Here is the sea level rise at the Aleutian Island of Unalaska, Alaska. One can only hope that the predicted snowfall is off by a factor of 5 or so. Massive forest fires are also often exacerbated by earlier mistakes by foresters. For decades, they thought it best to put out all the fires they could. Today, they recognize that fire is a natural part of the environment; that when you don’t allow small, natural burns to happen, dead wood and brush build up, leading to massive conflagrations later. Today, foresters are looking to only fight those caused by non-natural events (camp fires that run away, arson, etc.,) or those that are a threat to inhabited areas, and let nature take its course with the rest. Instead of dismantling our nuclear arsenals, I think they should be used to combat global warming through (what I am claiming copyright as) induced “Limited Nuclear Winter.” See, we pop off a few of the Soviets’ (ooops, Russians’) big ‘ole bad-boys and it creates this cloud that protects us from the life-giving rays of the sun that are currently teaming up to kill us. I’m open to suggestions as to where I’m going wrong here, but The Donald sez he’s all in.